I wish to share some cheer – from the Southern Hemisphere! I almost feel guilty sometimes, to be posting about our beautiful spring when some bloggers in the Northern Hemisphere are expressing regret as the days become shorter. This is perhaps my most favourite photo of those I’ve taken to date. All my photography is done with a basic cellphone camera and I don’t usually succeed in capturing flower and small creature detail with such clarity. Text and Photo by Liz; Exploring Colour (2018). Taken 15 Sept at Maple Glen, Southland. Beautiful picture, Liz. I hope you’re staying warm. After a beautiful weekend of 20+ temperatures that front is starting to make itself felt here today. Good old spring. No need to feel guilty, Liz, in six months the shoe will be on the other foot! Nice rose with the little creature making his way. Loving spring so much Ellen. That’s actually a daffodil but its certainly rivalling any rose for beauty! Eh gads, not sure where I got the rose reference, but your right it is a beauty. Beautiful shot, Liz, and extra points for capturing the spider too. Some of my friends think that you have to have all kinds of fancy and expensive camera gear to get good photos. The reality, as your image clearly shows, is that gear is only one small factor in obtaining wonderful results. More important, I think, is the ability to see the possibilities inherent in a situation and then compose an image that matches that vision. It’s better to be out there shooting with what you have, aware of its capabilities and limitations. than to stay at home dreaming of better equipment. The “seeing” and the composition is hugely important for sure, a BIG part of the process! I’m also passing on Nigel’s thanks for looking at his latest post and leaving a “like” 🙂 Cheers Mike! Absolutely Tanja! 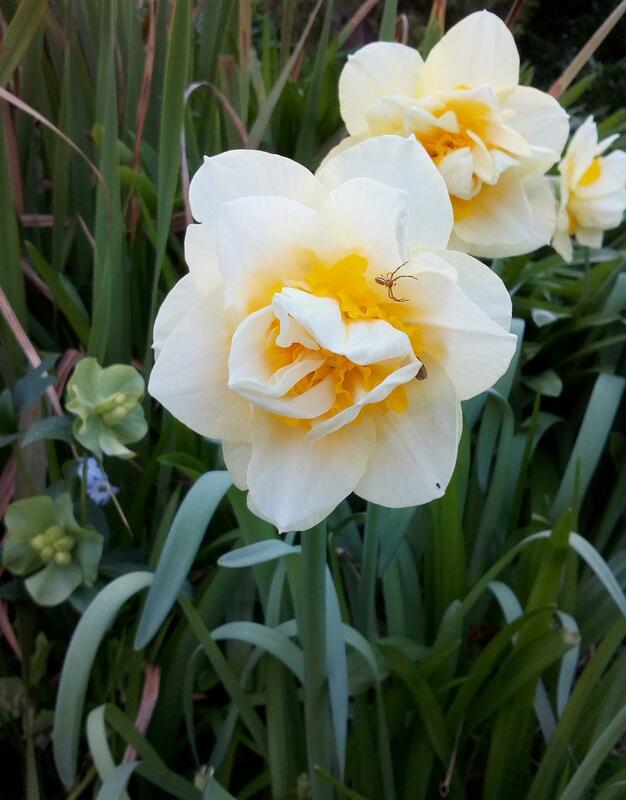 I really love this particular daffodil. Maple Glen has a nursery so if we ever have our own garden again I could probably get it from them. That’s a happy thought! Gorgeous Liz. Enjoy your glorious NZ weather! Thanks Tina! We’ve had a good run so far but the forecast is a return to winter for the next four days. From your post it sounds like you escaped the worst of Hurricane Florence. I’m relieved! (I did think of you when it was in the news). Take care. absolutely sensual and beautiful even down to the tiny denizen spider!! Thanks so much for the link to my post and that it inspired you though I hesitated to post it!! Glad I did!! Oh my….now that is lovely. It reminded me that I need to get my daffodil bulbs in the ground ASAP. And I think you’re a fantastic photographer! You’re very kind to say so Carol! Thank you so much!!! Thank you! A beautiful way to start my morning! Happy Spring to you, Enjoy! Thank you very much and I hope you get a beautiful autumn full of colour! You are welcome and thanks, I hope so too! I’m enjoying the spring very much. Weather in NZ is always very changeable with a wintry change forecast from tomorrow for four days which I’m not too happy about at all!! !